You can tell me if this is not the place to ask this question, but I don't know where else I should. I've searched for and looked though a couple of older questions about the 'Beta' part in the site's title, but I cannot seem to find an answer that seems up to date. Is anything still missing for the site to no longer be in beta? Is it really just about the amount of questions asked per day? When Stack Exchange started launching sites beyond the trilogy (Stack Overflow, Server Fault, and Superuser), they imagined a pretty quick run from beta through to graduation -- months, not years. That's not how it worked out, though, and many sites have stayed in beta for upwards of half a decade. This has led to discussion of removing the 'beta' label entirely after some time, and Stack Exchange announced changes to its approach in 2015. The key point from their announcement is that they won't shut down beta sites any more (unless they become ghost towns); sites that are slow to grow need not fear the reaper any more like we once did. 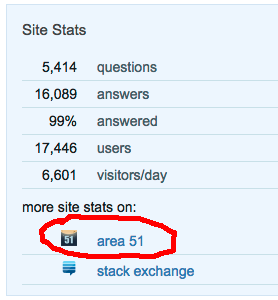 In that post they also announced that when a site consistently reaches 10 questions per day they'll consider it for graduation -- most of the other Area 51 stats aren't important (though we're also doing fine on them). Another thing that used to delay graduation was waiting on the custom site design -- a site might be doing just fine, but SE has only a few designers so it could take months and months to complete that part. SE now has design-independent graduation -- when we're ready to go we'll go, and later we'll get a design. We're not ready to go yet based on current rules, but when we are, we won't be blocked on design. The best thing we can all do to advance Writers.SE is to help raise the level of quality questions -- ask more, recruit your friends, promote the site. But don't just throw junk at the front page to boost a stat; that doesn't help us be a good site and just makes work for the community to curate those questions. Remember that this site is about writing in all its forms, creative and otherwise -- novels, short stories, technical writing, scriptwriting, journalism, scientific writing, API documentation, marketing brochures, academic theses, poetry, instruction manuals, etc. Not the answer you're looking for? Browse other questions tagged discussion site-evaluation site-definition . Why are our traffic stats so low?